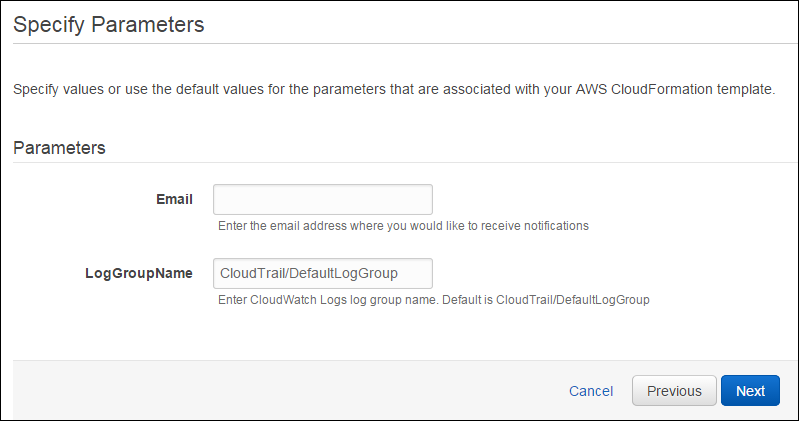 After you configure your trail to deliver log files to your CloudWatch log group, you can create CloudWatch metric filters and alarms to monitor the events in the log files. For example, you can specify an event such as the Amazon EC2 RunInstances operation, so that CloudWatch sends you notifications when that event occurs in your account. 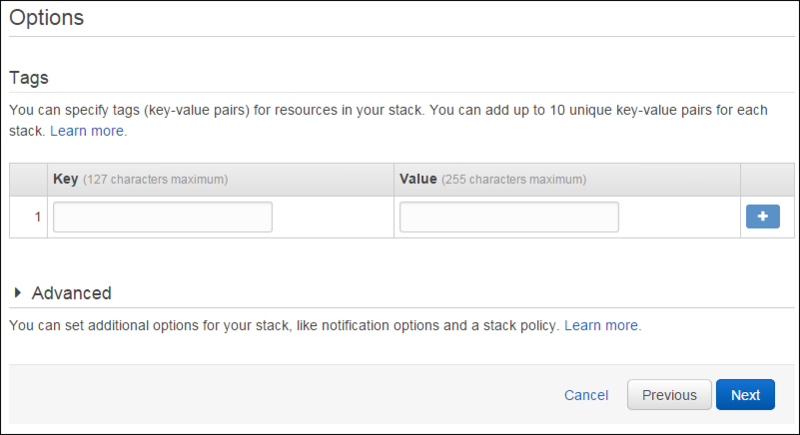 You can create your filters and alarms separately or use the AWS CloudFormation template to define them all at once. You can use the example CloudFormation template as is, or as a reference to create your own template. The CloudFormation template has predefined CloudWatch metric filters and alarms, so that you receive email notifications when specific security-related API calls are made in your AWS account. When an API call occurs in your account, a metric filter monitors that API call. If the API call exceeds the thresholds that you specify, this triggers the alarm and CloudWatch sends you an email notification. By default, most of the filters in the template trigger an alarm when a monitored event occurs within a five-minute period. You can modify these alarm thresholds for your own requirements. For example, you can monitor for three events in a ten-minute period. To make the changes, edit the template or, after uploading the template, specify the thresholds in the CloudWatch console. Because CloudTrail typically delivers log files every five minutes, specify alarm periods of five minutes or more. To see the metric filters and alarms in the template, and the API calls that trigger email notifications, see CloudFormation Template Contents. A CloudFormation stack is a collection of related resources that you provision and update as a single unit. The following procedure describes how to create the stack and validate the email address that receives notifications. Configure your trail to deliver log files to your CloudWatch Logs log group. See Sending Events to CloudWatch Logs. Download the CloudFormation template: https://s3-us-west-2.amazonaws.com/awscloudtrail/cloudwatch-alarms-for-cloudtrail-api-activity/CloudWatch_Alarms_for_CloudTrail_API_Activity.json. On the Select Template page, for Name, type a stack name. 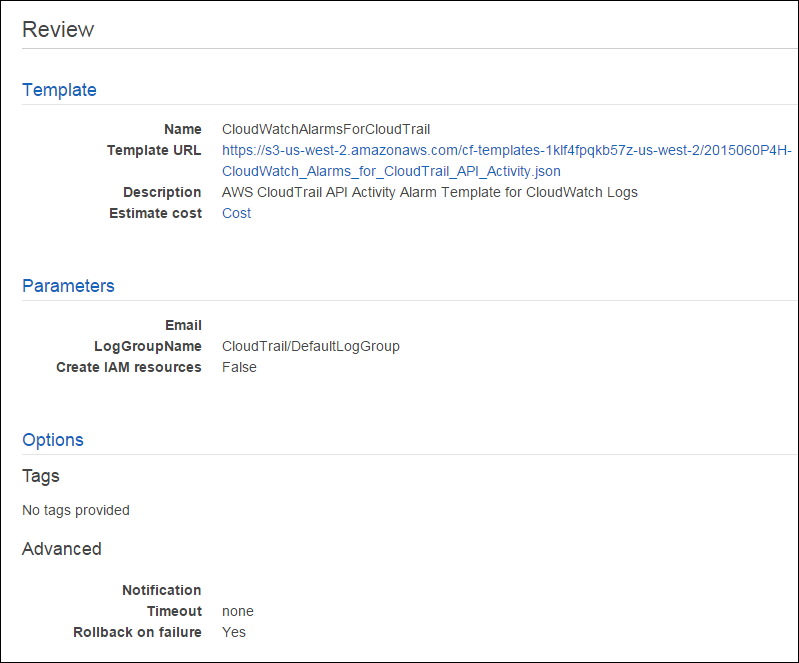 The following example uses CloudWatchAlarmsForCloudTrail. For Source, choose Upload a template to Amazon S3. Choose Choose File, and then select the AWS CloudFormation template that you downloaded. On the Specify Parameters page, for Email, type the email address to receive notifications. For LogGroupName, type the name of the log group that you specified when you configured your trail to deliver log files to CloudWatch Logs. On the Review page, verify that your settings are correct. Choose Create. The stack is created in a few minutes. After the stack is created, you will receive an email at the address that you specified. In the email, choose Confirm subscription. You receive email notifications when the alarms specified by the template are triggered. 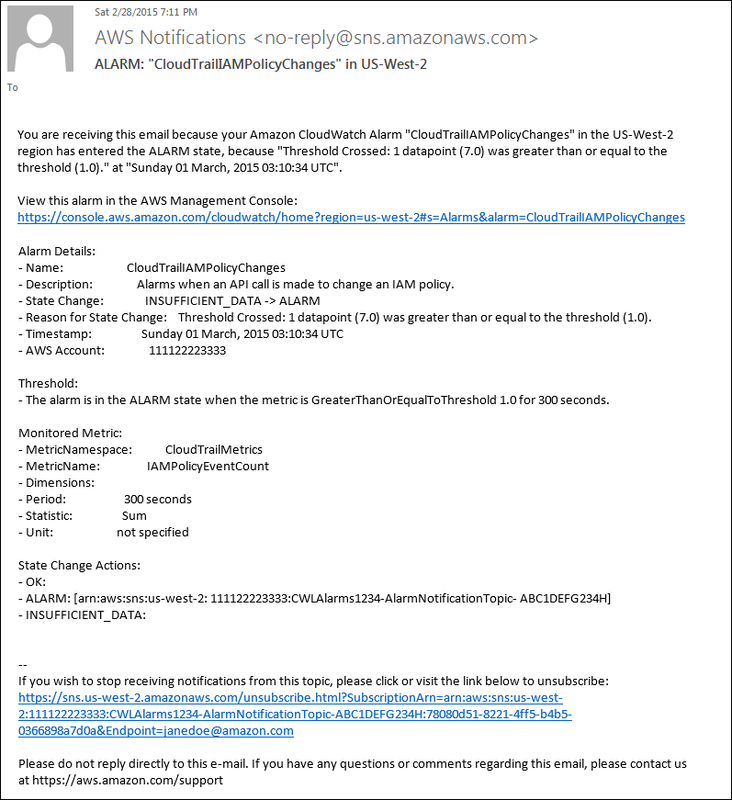 The following example notification was sent when an API call changed an IAM policy, which triggered the metric alarm. The following tables show the metric filters and alarms in the template, their purpose, and the API calls that trigger email notifications. Notifications are triggered when one or more of the API calls for a listed filter occur in your account. You can review the metric filter or alarm definitions in the CloudWatch console. API calls that change bucket policy, lifecycle, replication, or ACLs. API calls that create, update, and delete security groups. API calls that create, update, and delete network ACLs. API calls that create, update, and delete customer and internet gateways. API calls that create, update, and delete virtual private clouds (VPCs), VPC peering connections, and VPC connections to classic EC2 instances using ClassicLink. 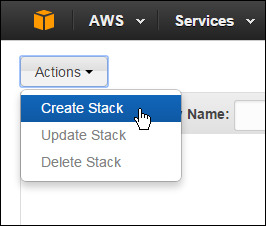 The creation, termination, start, stop, and reboot of EC2 instances. The creation, termination, start, stop, and reboot of 4x and 8x large EC2 instances. Creating, deleting, and updating trails. The occurrence of starting and stopping logging for a trail.